When a new dresser doesn't have time to air out after stain or varnish is applied at the factory, the smell will come home to you. The chemical smell in a new dresser not only fills the bedroom with an unpleasant odor, it also lingers behind on your clothes. Once you remove the chemical smell from the dresser with items in your home, keep it smelling fresh so you can enjoy your new furniture without offensive odors. 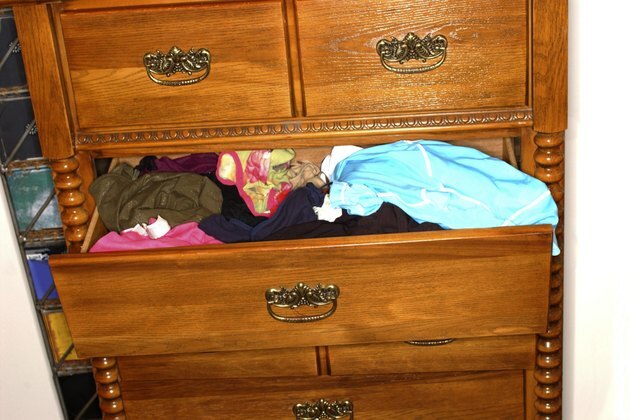 Remove dresser odors to protect your clothes from the smell. Remove the dresser drawers and place them on the floor. Open the windows in the bedroom so air can circulate. If possible, place fans next to the window to blow the air outdoors for a few hours. Place the drawers back into the dresser. Stuff the dresser drawers with crumpled newspapers, which will absorb the chemical odor overnight. Fill small bowls with kitty litter if the smell remains. Place the bowls in the dresser drawers until the litter removes the odor. Remove strong chemical odors by lightly sanding the inside of the dresser drawers. Vacuum up the wood shavings. Dampen a washcloth with white vinegar and wipe down the dresser drawers. Line the dresser drawers with dryer softener sheets to keep them smelling fresh. Tape the sheets in place to prevent them from sticking to clothing.